Sometimes you feel more like “the maid” than “the mom”. And while you want your kids to pick up after themselves, it feels pretty overwhelming on days when you are just trying to keep everyone alive and the house from burning down. So it’s faster to do it all yourself and skip the nasty battles that come with getting kids to clean up. But teaching a child to clean up doesn’t have to be complicated and time consuming. By taking some simple steps now to teach your children to clean their own room, you can teach responsibility and save yourself loads of time and energy. If a child can play with toys and make a mess, a child is capable of learning to clean up. Children are these incredible little sponges. It never ceases to amaze me how quickly my 4 kids learn things. Their brains are incredible at picking up patterns and following them. If you teach them that you will always clean up their messes, they’ll learn that in a heartbeat. But if you teach them that they’re responsible for their messes, they’ll get into the routine of picking up after themselves. Before you really dig into teaching your child to clean their room, you’ve got to make sure it’s going to be an easy task for your child to tackle. The room needs to be simply organized with clear places for every item. Does everything have a clear place? How can I change the room to make it easier for my child to clean? Then organize your room so that it’s easy for your child to know where everything goes and it’s easy to put everything away. Taping images on boxes, bins, and drawers can be extremely helpful in teaching kids where everything goes. I do this with my kid’s drawers and it has been a game-changer. To say my girls love clothes is a major understatement. Without exaggeration, it’s perfectly normal for any one of my 3 older kids to change their clothes anywhere from 5-10 times a day on any given day. Massive piles of clothes littered my house from the moment they started dressing themselves. A few years ago, I looked at the daily deluge of clothes on their bedroom floor and I snapped. I wasn’t about to clean up another huge mess of clothes. Something needed to change NOW. So I got some 3 x 5 notecards, drew pictures of the clothing items that go in each drawer, and taped them on each of my children’s drawers. I then gave them a brief tutorial explaining that they need to put the clothes in the corresponding drawers. Then I hoped for the best. And it was nothing short of miraculous what happened. With a little bit of direction my clothes-loving girls actually started to put everything away in the correct place. Picture labels make all the difference. 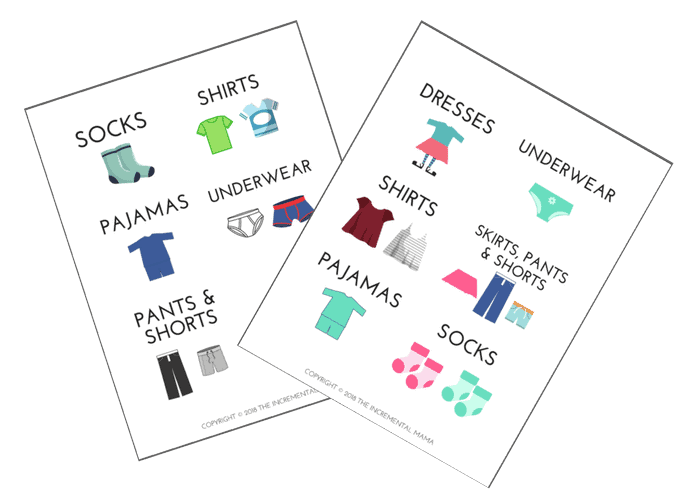 If you don’t feel like drawing, I created a free printable of both boy and girl clothes drawer labels. Children are very visual and physical learners. Not only do we need to tell them what to do, we need to show them and lovingly guide them. While you model the correct behavior, explain to your child what you are doing. This ensures that they fully understand your expectations and know when they are on target. Children need clear instructions. When I just spout off vague instructions to my kids, you can bet they just look at me like I just told them to build a spaceship. But when I point, walk them to where I want them to be, and give clear and simple instructions, they’re excited to help. And kids crave attention and praise. Which is why they act out and hit their sibling or throw a fit. Because you snap to and give them 100% of your attention. But if they get it when they clean and are helpful, they’re going to clean and be helpful. Children crave routines that they can expect and predict. If you’re constantly cleaning up after them, they’ve got that logged away and they know that is the routine: Mom’s the maid. But if you want your child to start cleaning, it’s time to change the routine and create new patterns that you stick to. When your children have a clear cleaning routine, it will reduce the battles. If you are consistent, not only will your child respond without having a meltdown, but eventually they’ll begin to clean before you ask them since they know it’s inevitable. As part of their bedtime wind-down routine, my girls know that they are expected to have their room clean in order to get a story and a song every night (and they’d sooner cut off their own toe than miss the story and song). As it’s become an established routine, they’ve become quick and efficient little cleaners. Hallelujah! The quickest way to sabotage a child’s attitude and the mood in your home is to be moody and negative. Be it potty training, school work, or what have you, when we start to get irritated and snarky with our kids, they will respond the same way. Always give encouragement and praise for their efforts when teaching a child to clean. Praise and positivity go a really long way in helping to motivate a child. Helping them see how helpful they are and that what they do makes a difference will completely change their behavior. When I am super positive and complimentary, not only do my 4 and 5 year old ditch any bad attitudes, but they can clean a messy bedroom in no time at all. If they don’t clean up, give them consequences. Natural consequences are best. We put toys that have not been picked up when they were supposed to be picked up in “toy jail”. These items go in a big clear plastic container that lives in a high (and unreachable) shelf in my closet. And my kids have to do various chores to earn their toys back. Unless your children are actual angels, you’ll probably get pushback on the new expectations. If there are no consequences when they don’t clean, they’ll learn that they don’t need to clean. As your child becomes more and more capable, it can be easy to just enjoy the new help and leave it at that. But it’s important to keep your child growing and becoming more independent. You can increase their responsibility by giving less specific directions and even adding tasks to their cleaning routines. Once they get cleaning their room independently, find other cleaning task for them. For us, this has meant gradually learning to clean most areas of the house, helping with the laundry and in the kitchen. The same principles above apply to any cleaning job! I know it’s not easy. Mom life is super hard. We have moments where we can’t care about much more than making it to the end of the day, let alone having children who clean up after themselves. I’ve been there. But if we are not consistent in our efforts and expectations, children will pick up that this is not important and not something they need to learn. On the other hand, being consistent teaches our children that these expectations and responsibilities are here to stay and will be enforced. Children’s brains are amazing at picking up patterns. If the pattern is that you won’t stay consistent, they will not comply. If the pattern is that they need to keep their room clean, they will! And in the long run, you’ll have so much less to do. Because you’re basically training your kids to be helpful cleaning machines. I’m not going to lie, teaching my kids to clean up after themselves has been a struggle at times. Sometimes they have fought me vigorously and tested whether I will be consistent. But the struggle to teach a child to clean is worth it. These days, my kids are now amazing at cleaning up their rooms. And the excitement and sense of pride they have when they show me their immaculate room absolutely makes my heart sing. This is Genius! I love the idea of taping the printable on the drawer. My babe is still a little babe, but sharing a link to this with my family.